At Stone Yard, we believe that good luxury design is livable—and that furnishings should be not only aesthetically pleasing but welcoming. Nowhere is this more important than in hospitality design, which seeks to create a fantasy getaway atmosphere for guests, but with all of the comforts of home. Here is a list of hotels and resorts that inspire us by achieving this delicate design balance. 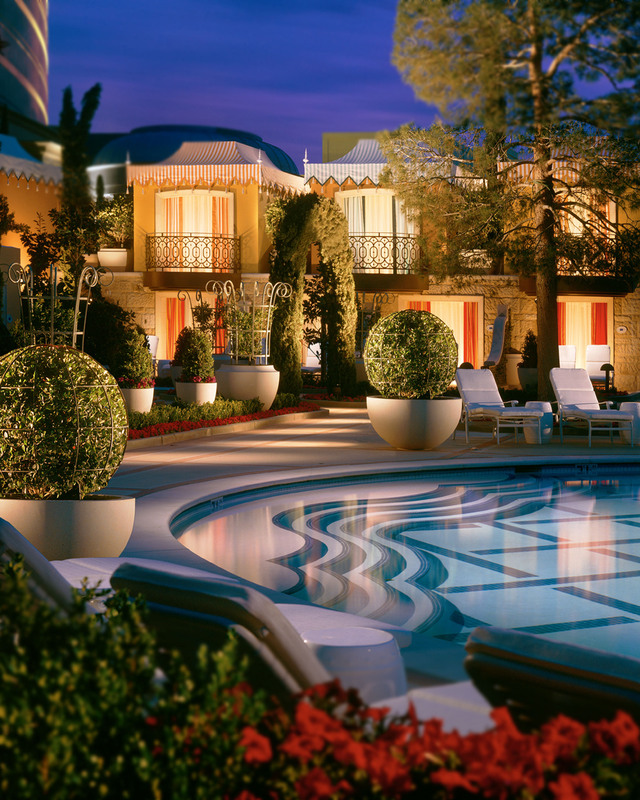 Wynn Las Vegas and sister resort Encore Las Vegas both have design themes that mix a bit of whimsy and drama into an overall refined palette. 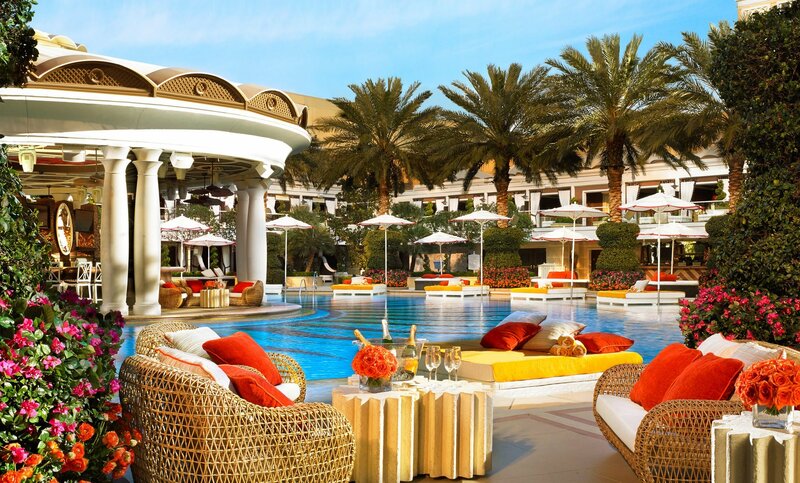 The interior design theme of Wynn Las Vegas is nothing short of opulent. Hand-embroidered fabric-covered walls, onyx floors, handwoven carpets, glowing parasols that hang in a delicate ballet from the lobby's ceiling—all are meant to evoke a sense of heightened awareness, romance, and mystery. This sensory experience is continued outdoors to the main pool area, which offers a European-style pool that has a decidedly modern luxury feel complete with artful furnishings highlighted with bright color accents. The Encore’s design is heavily influenced by the Asian culture, with red featured strongly into the color palette. Chinese dragons and other cultural artwork dot the landscape, which has an overall muted color scheme that allows the rich red and black design elements to emerge from their neutral background. Stone Yard pieces featured at Wynn and Encore Las Vegas: Gear Cocktail Base, Mondo Bowl Planters, James Planters, Swirl Planters, Pomegranate Mirror, Rock Console Base, custom tall urns and wall panels. 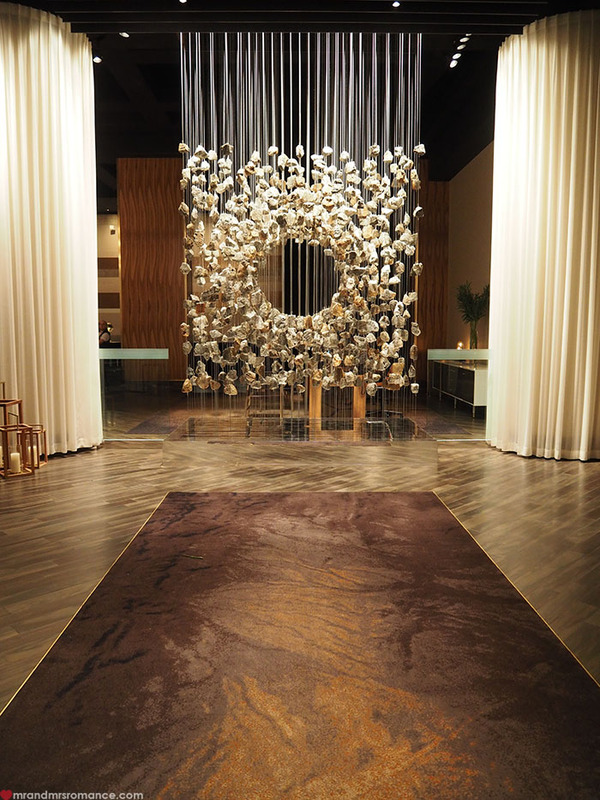 The Mojave Desert was the inspiration behind the Delano Las Vegas's interior design, which is reflected in the natural stone accents, neutral color scheme, and rugged textural pieces. 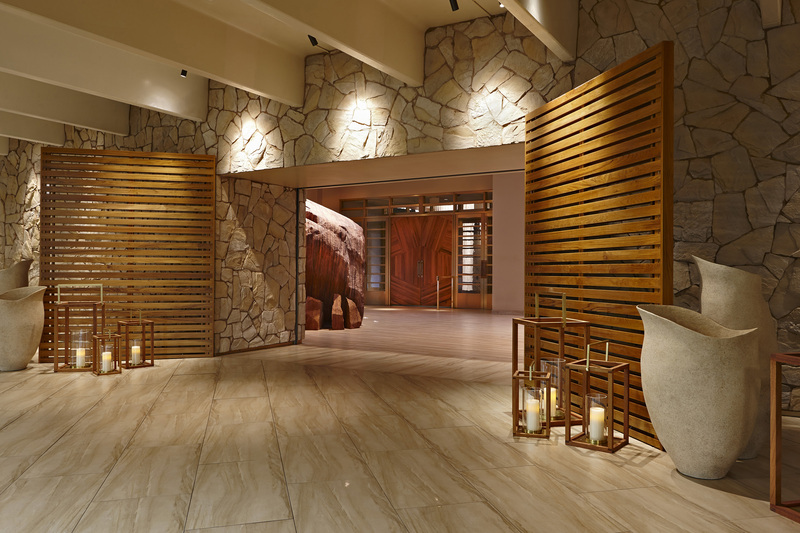 Nature-inspired design elements include two 10-foot tall boulders (weighing a collective 126,000 pounds) and an art installment featuring hundreds of small rocks suspended from the ceiling of the hotel's HOSPY award-winning entryway. 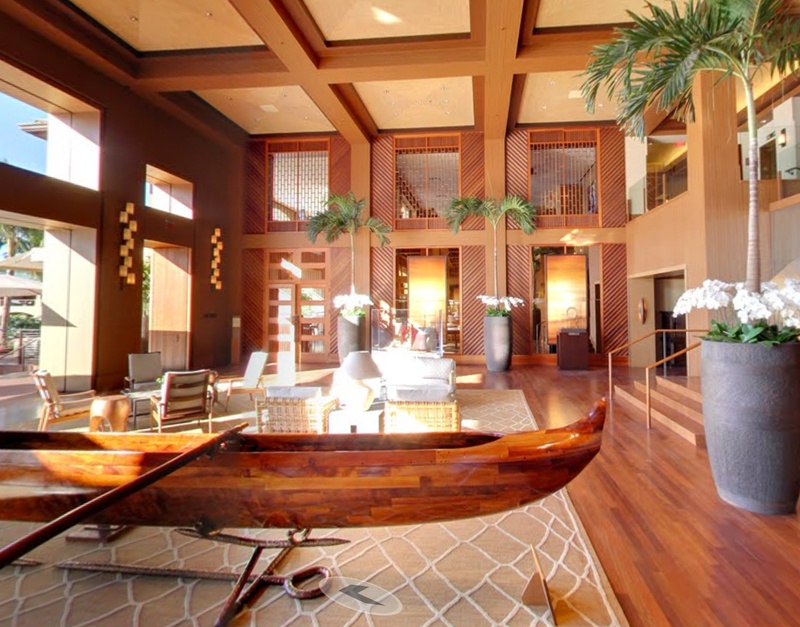 The Four Seasons Lanai is an acclaimed, award-winning resort situated among the lush mountains and secluded beaches of the tiny, 90,000-acre island of Lanai. 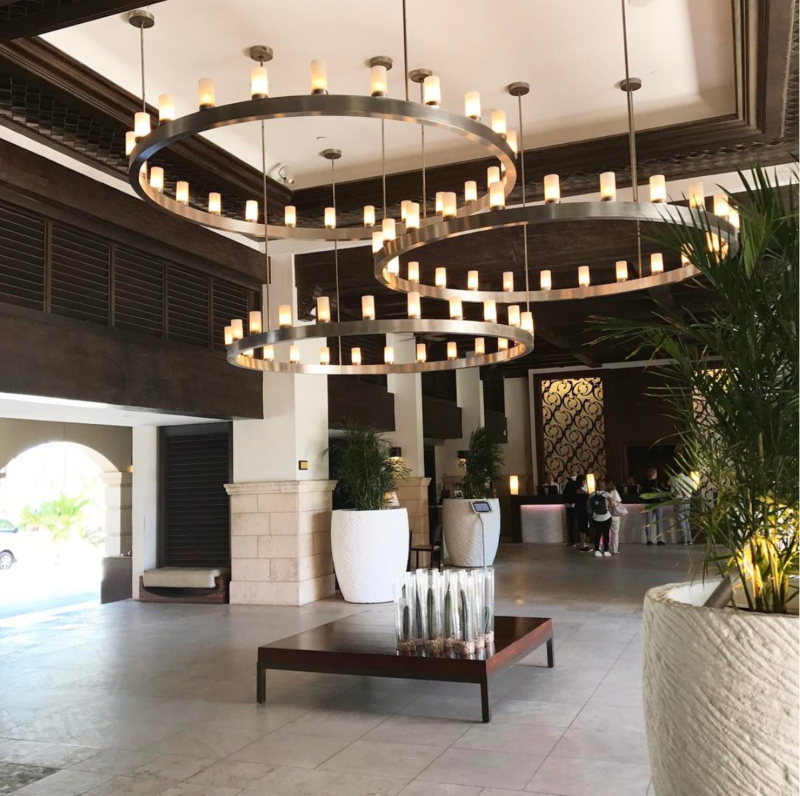 But the tranquil charm of the island doesn't stop at the door: the hotel's interior features an abundance of natural textures, from slate and stone to bamboo and mahogany. Hawaii's laidback beauty is effortlessly reflected in hand-woven wool rugs, teak and zebra wood accents, tropical plants, and custom artwork depicting native island scenes. 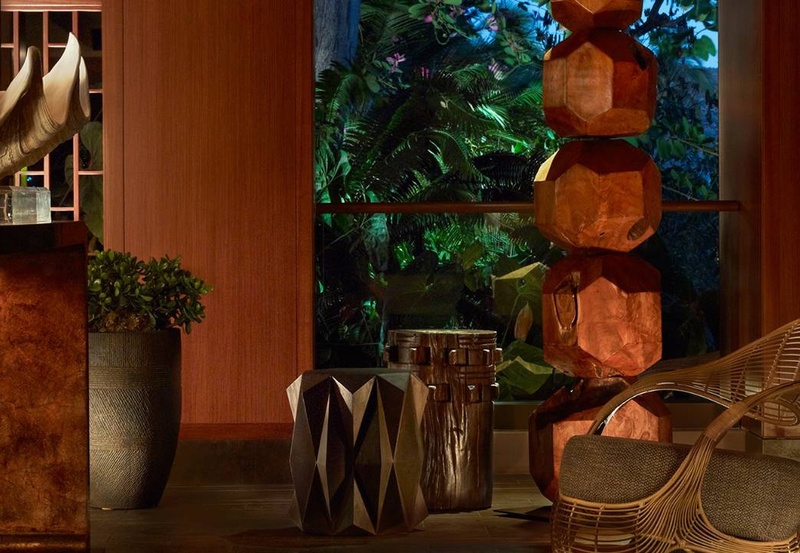 Stone Yard pieces featured at Four Seasons, Lanai: Zaragoza Planters, Pucati Side Tables, Zaragoza Daybeds, Bamboo Table Bases, and custom art panels. 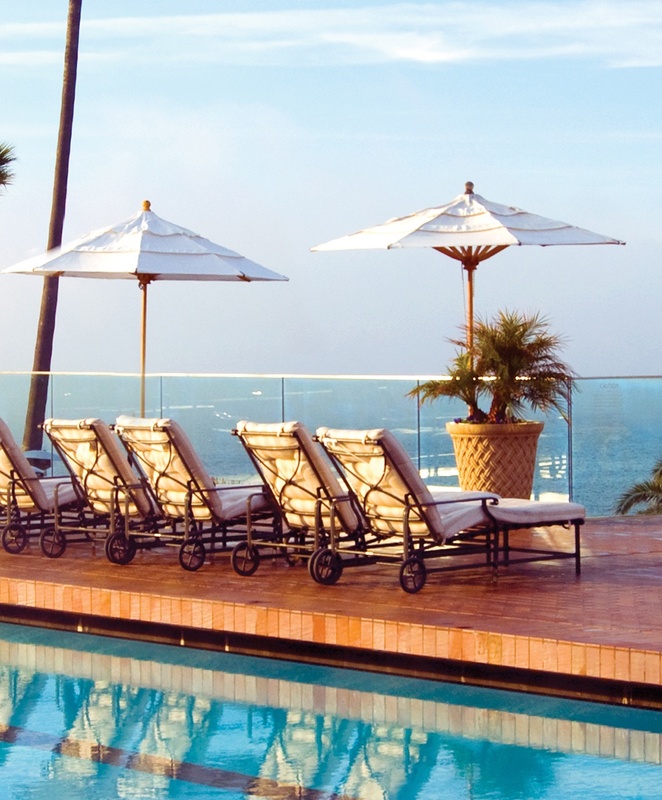 Nestled in the heart of Southern California and perched atop dramatic coastal bluffs sits the Montage Laguna Beach, an award-winning luxury resort on 30 acres of coastal beauty. The interior design reflects beach living: simple, uncluttered, and casual furnishings in soothing creams with wood accents. Outside, the sprawling green grounds and arresting ocean views create a stunning panorama that complements the resort's elegant craftsman-style architecture. 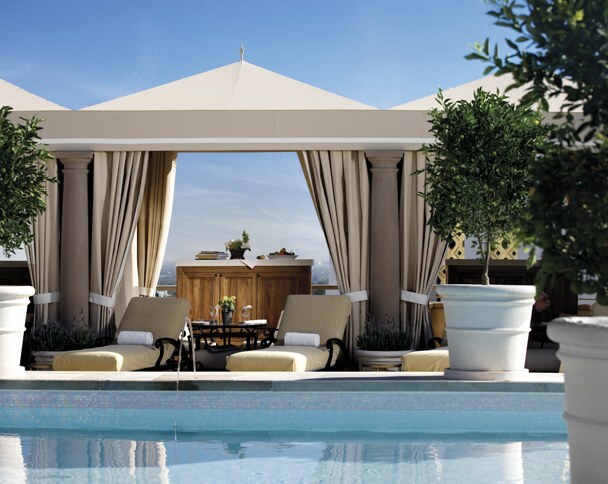 The Montage Beverly Hills also captures the essence of its location, with Spanish Colonial Revival architecture and interior design that mixes Spanish, Italian, and Moroccan design elements with vintage Hollywood style. The interior features crystal wall panels, hand-knotted Egyptian rugs, fine Italian linens, and gallery-level art pieces. The grounds offer a rooftop pool, which is inlaid with glass mosaic tile and mother-of-pearl accents, overlooking Los Angeles and the Hollywood Hills. 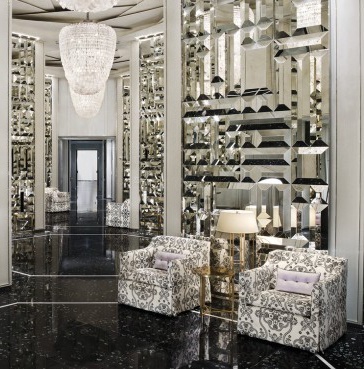 Located in Bal Harbour, an exclusive Miami Beach enclave, the St. Regis is a five-star, five-diamond resort of modern luxury. 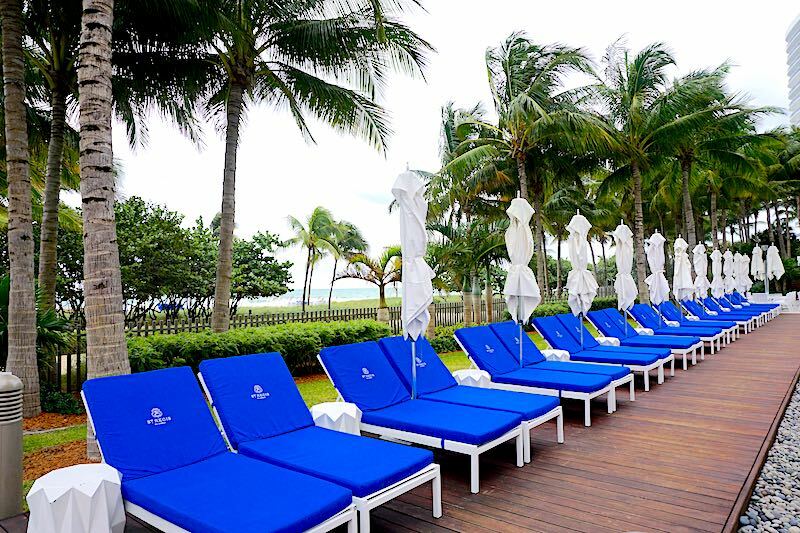 Art Deco embellishments like beveled mirror walls, hand-hung crystal chandeliers, and black marble floors, give this beachfront resort an elevated style. Furnishings are clean-lined and contemporary silhouettes in a color palette of warm yellows and whites. 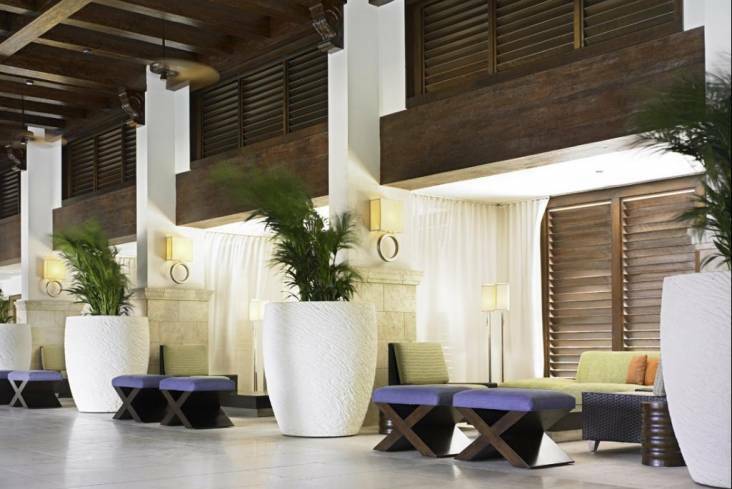 A paradisiac oceanfront resort in the heart of the Caribbean, Hyatt Regency Aruba is a top-tier hotel with high-end design. Light sandstone flooring, streamlined cylindrical chandeliers, and chic white furnishings in modern high-gloss finishes keep the design contemporary. A color palette of soft blues and greens that reflect the natural beauty of the ocean are offset by pops of bright nectarine orange that bring the spirit of the islands inside for all to enjoy. Looking to create inspiring designs of your own? Find out why Stone Yard has been a trusted design resource for hospitality designers and trade professionals around the world for more than 30 years. PHOTO CREDITS (Top to bottom, left to right): Hyatt; Wynn Resorts (two photos); MGM Resorts International (two photos); Four Seasons Lanai (two photos); Montage Hotels (two photos); St. Regis Bal Harbour Resort; Cara Goldsbury; Hyatt; Jordan Stevens.